Create a beautiful spring bulb container garden! It is the perfect way to bring spring beauty to any size garden. One large wide container at least 10 -12 inches deep with excellent drainage holes in the bottom. An assortment of spring flowering bulbs, starting with the earliest bloomers to the later bloomers include early minor bulbs, a few hyacinths for some fragrances, tulips that will bloom after the minors, then some late blooming daffodils. 2. Fill your container with soil-less potting mix. 3. Plant your bulbs will be at the same depth if you were planting in the ground. 4. 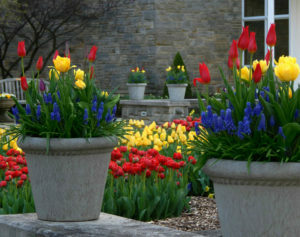 Layering Your Bulbs- The first layer of bulbs will be about 10-12 inches below the top of the pot. First layer your daffodils and lightly cover with soil. Next, layer your tulips. When planting, make sure your bulbs are not directly on top of each other. Slightly cover your tulips and add your hyacinths. Again, slightly cover your hyacinths with soil. Then, sprinkle with a little bulb food. Add more soil, then plant a layer of the minor bulbs about 4-5 inches below the top of the pot. Cover the minor bulbs with soil, lightly tamp. 5. Bulbs need to be cold for winter. Place your container outside until temperatures are consistently cold and then store your container in an unheated garage or shed or leave outside surrounded by leaves and mulch. 6. Throughout the winter, make sure your container has soil moisture. 7. In early March, move your spring garden where you can enjoy seeing the layers of beautiful bulbs. After, they finish you can even plant them in the ground to enjoy for years to come.